It's April, 2011 traveling up the Pacific Coast and detoured into the Willamette Valley; Oregon's premier wine country. 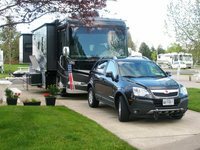 We were pleasantly surprised to find Olde Stone Village, a wonderful RV park in McMinnville, Oregon. Just had to add it to Best of the Best. Meticulously well kept, nice large sites, concrete pads, great utilities with soft, clean water and priced reasonably; $31/night daily, $175 weekly and $415 monthly during the peak summer months. And, 10% off daily rates for Good Sam. Continue reading #5 Olde Stone Village, McMinnville, OR. In our travels exploring the Northwest in a caravan with our good friends Rod and Betty Lawson, we discovered the Polson Motorcoach & RV Resort located on the south of Flathead lake in Polson, Montana. What an incredible find! Sites are fee simple ownership which the owner can improve. Landscaping is luscious, sites are wide, paved and have modern utilities. The resort overlooks the mountains to the west, Flathead Lake and the town of Polson. 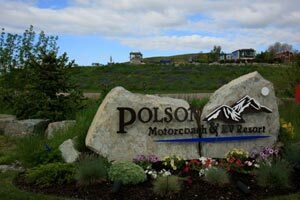 Continue reading #4 Polson Motorcoach & RV Resort. 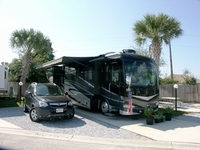 Continue reading #3 Hilton Head Harbor RV Resort and Marina. 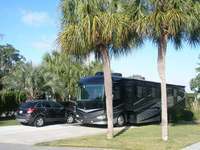 We were looking for a place to winter last year and an acquaintance recommended Palm Creek Golf and RV Resort. We stayed here January through March of 2009 and immensely enjoyed it. Palm Creek is for 55 and older and has just about every activity one could imagine; from golf and tennis to arts and crafts and weekly entertainment. The sites are high quality gravel and have a large concrete patio. Common area landscaping is exquisite. We met several people who have become friends. Look for ward to seeing them in 2011! 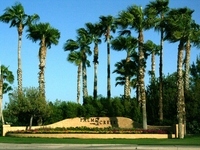 Continue reading #2 Palm Creek Golf and RV Resort. Outdoor Resort Indio is a fee simple ownership property which also rents owner's sites. It is a Class A only motor coach resort for coaches 34 feet or longer. It is absolutely immaculate. Exquisitely maintained, lush landscape, golf course, lakes, swimming pool and clubhouse. Continue reading #1 Outdoor Resort Indio. See our Road reviews in the "Best of the best" category.